AZ Locksmith offers fast and reliable auto locksmith services. With our tools and experience, we can regain access to your car without any damage. If the keys have been broken, or stolen, we can replace them very quickly. Each make and model is different, but we have experience with all types of cars and technology to make keys for each different one, even old and rare cars. Being locked out of your car can be very stressful, especially if it happens when you are away from your home and office. Keys can be accidentally left inside or suddenly break in the ignition and the boot lock can freeze or malfunction, leaving you stranded. Sometimes, locks are damaged from burglary attempts. There are lots of occasions when you might need assistance of a professional technician. AZ Locksmith provides fast and reliable auto locksmith service for all your needs. A mobile locksmith means that instead of you needing to come to us to receive service, we come to you. We always have 24 hour auto locksmith close to you as our technisians operate in local areas and it helps us to reduce the response time. We drive fully equipped vans and everything necessary for an auto lockout is available: tools, hardware, products and repair parts. Because we operate on-site, we can get the job done faster, saving you time and money. We offer mobile locksmith services 24/7, 365 days a year, including weekends and public holidays. You can call us anytime of the day or night and reach a live security expert - no automated menus. Because we’re always open, there’s no extra fees for non-business hours. Furthermore, whether you have locked your key inside the car or have another auto security problem, you need to find a reliable and mobile auto locksmith. We operate locally, with each of our technicians operating in a set service area, meaning one is never far away. Our local operation means that we are familiar with your neighborhood and can reach you quickly. The same speed of service is provided in rural areas and suburbs as it is in the city centre. If you have lost your car key and need to make another, we can do this on-site. Our car locksmiths bring with them top-grade key cutting equipment and a wide variety of blank vehicle keys in order to do any job quickly and accurately. We recommend making a spare key at the same time, reducing the chance of being locked out again. In addition to cutting blade keys, our auto locksmiths can also program remote keys and hands-free proximity keys to the highest standard. The process of programming remotes varies by make and model, but for most cars, remotes can also be made on-site. Some specialty cars will require a special order, which we can place for you. 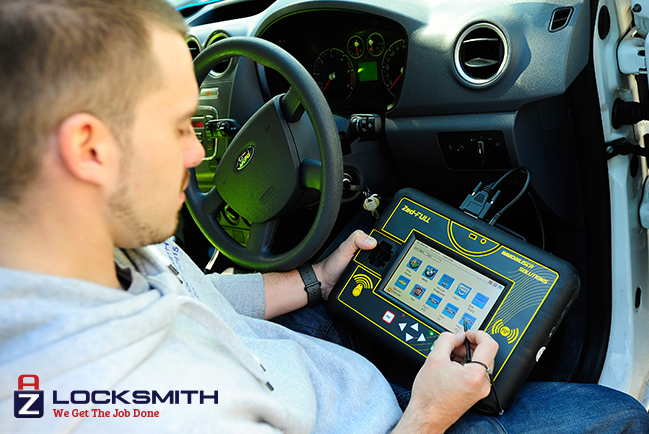 How fast can the mobile auto locksmith come to me? Our local technicians will drive to your location in about 15-20 minutes, depending on your proximity to our available automotive locksmiths. We provide mobile services, which means that our security experts are available in fully equipped vehicles 24/7. Our technicians are spread in different areas to help our customers as soon as possible. Can your car locksmiths provide services for my make and model? 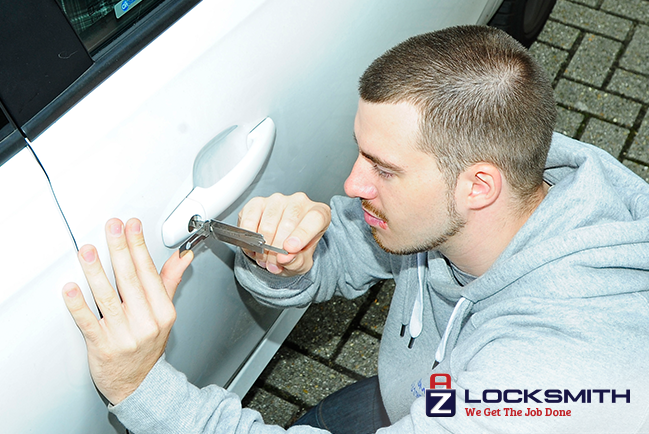 AZ Locksmith is able to unlock almost all cars, regardless of its year, type or price. Our car locksmiths are experienced in dealing with all makes and models and have a lot of different tools and hardware, in order to do any job on-site, in the shortest possible time. For getting an additional information about your particular car, please visit our auto useful information page. How fast can you open my car? Usually, it takes about 5 minutes to open a car. However, if a transponder key is needed, then the duration of the service will depend on the complexity of the key. Our auto technicians will inform you about the approximate time to unlock your vehicle before starting the work. I’ve lost my car key, can you unlock it anyway? Yes! We can open your car even if you have lost the last copy of your keys. Our licensed security experts use special methods for unlocking different vehicles. Our auto locksmiths are equipped with all proper tools, in order to provide you with a high-quality service even if you can’t find your car keys. Moreover, our mobile technicians can cut keys right on the spot, thus saving you time and money. Will my vehicle be damaged? No! No way! Our master locksmiths are well-trained and equipped with up-to-date tools to ensure that each task will be completed without causing any damage to your vehicle. Our proficient technicians have already served hundreds of car owners without any damage to their vehicles and we guarantee you a smooth car lockout process. AZ Locksmith offers the flat and cheap auto locksmith prices. We don’t have any hidden fees. Before we do anything, we will review the procedures and costs with you, so you know and agree to everything done. There’s no extra charges added on after the service is done, and there’s no surcharge for nights or holidays. This flat price makes us different from a lot other vehicle locksmiths. If you need to find swift and professional 24 hour car locksmith, we are ready to provide high quality service. Our team consists of highly trained specialists who can help you find the best solution for your unique situation. We make sure to have a live security expert ready to answer your call, meaning you can explain your situation quickly. We’ll answer all your questions, offer security advice, and stay with you until the job is done. We always use the best quality products and parts from the leading brands to make sure they operate reliably and last for years. We even offer a one-year guarantee on any part or service we provide. We constantly work to make our operations even more efficient without sacrificing quality, as our goal is to get your car open and running as soon as possible and get you back on your way.